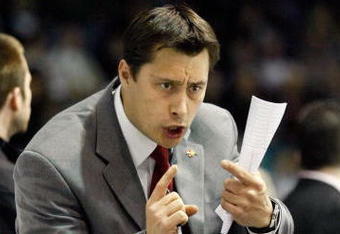 The Columbus Blue Jackets have offered their head coaching position to Guy Boucher, as broken by The Columbus Dispatch. Boucher will reportedly take the weekend to mull over the offer before making his decision early next week. Boucher, 38, spent this past season coaching the Hamilton Bulldogs, the American Hockey League affiliate of the Montreal Canadiens. He led the Bulldogs to a 52-17-3-8 record in 2009-2010, and came within one period of making the Calder Cup Finals in his first season with the team, his only coaching in the pros. The consensus feeling is that Notre-Dame-du-Lac, Que. native was being “groomed” for the head coach spot at Montreal, which is currently occupied by Jacques Martin. That theory, along with his relative inexperience, has led to speculation that Boucher may not accept a National Hockey League coaching offer this year. Still, there is no debating that he is one of the rising stars in coaching, and he will find his way behind an NHL bench sooner rather than later. Boucher has been influence by likes of Jacques Lemaire, Mike Babcock and Pat Quinn, but has gained notoriety for his own revolutionary system. Boucher’s teams play an “extremely aggressive” offensive style, focusing on moving the puck up the ice at all times and he is not shy about letting defenseman lead the rush. On the power play, Boucher applies an unusual 1-3-1 setup as opposed traditional overload or umbrella. One player sets up in front of the net, one in the high slot, and a pair along the sidewalls while a defenseman roves along the point. It creates havoc for penalty killers who can be easily exposed in a diamond or box arrangement. Boucher also applies an unconventional 1-3-1 forecheck. The first skater in the zone pushes the puck toward the outside. The left defenseman sets up along the left wall, as opposed to center ice as is the case with most 1-3-1 systems. The other two forwards occupy the center ice and the right side, creating a wall in the neutral zone, and the right defenseman covers the back end, where he is free to adjust on the fly. Some have likened his forecheck to a full court press. Boucher has also garnered plenty of praise for his ability to develop and motivate players, especially youngsters. The McGill University graduate has three degrees, including a master’s in sports psychology. Blue Jackets center Derrick Brassard played under Boucher in 2006-2007, when he was of the Drummondville Voltiguers, and he made no secret of his affinity for his former, and likely future, head coach. Despite all the positives, there are still plenty of questions surrounding the possible CBJ-Guy Boucher marriage. Although Boucher has seen success at every level of coaching so far, there is no guarantee that his system will succeed in the NHL, where so much time is spent breaking down video to expose any possible weakness. Teams will game plan and find holes. There is also the issue of his experience. Boucher has spent only one season coaching professionals, and spent only three as a head coach in the Quebec Major Junior Hockey League prior to that. Age could also be a factor as Boucher, who at 38-year-old, has only four years on the elder statesman of the Blue Jackets roster, Chris Clark. Although a player such as Clark would never admit it, some veterans do not mesh well with young, inexperienced coaches. In addition, the current make-up of the Blue Jackets roster is not necessarily conducive to Boucher’s systems. With the exception of Kris Russell, and Anton Stralman on occasion, the Blue Jackets defense lacks the mobility and puck handling skills to push the play forward. There is also no question that there is a significant learning curve to adjust to Boucher’s system. Still, there is no denying that, of the four final coaching candidates, Boucher is the most intriguing. That was clearly the case for Blue Jackets general manager Scott Howson. While former Blue Jackets player and development coach Kevin Dineen was considered the early favorite for the position, Howson insisted on waiting to interview Boucher, whose playoff run with the Hamilton forced the coaching search to extend into June. Other candidates include Scott Arniel, head coach of the AHL’s Manitoba Moose, and Claude Noel, who took over after Ken Hitchcock was fired in February. The Dispatch has reported that Howson met with Boucher twice. The first time was at the NHL Scouting Combine in Hamilton, Ont. last month. The second conversation took place last week in Columbus, likely at John P. McConnell’s Double Eagle Golf Club. It appears that the Blue Jackets have finally found their coach. Howson put in his time and due diligence, and it’s my belief that it will be reflected next season, regardless if Boucher is behind the bench or one of the other candidates. Then again, it could very well backfire if Boucher declines the position. Some have reported that there’s nothing left but hammering out the specifics of the contract, but with the Blue Jackets, you can never take anything for granted.